In a display of ChampCar World Series spirit, Bruno Junqueira is given a second seat to occupy by FAZZT Race Teams. In a what goes around, comes around moment and CCWS spirit, Alex Tagliani is able to repay a debt to a former teammate and friend when he was able to have a second car available for Junqueira after Bruno gave the qualified Conquest Racing entry on Bump Day in 2009, which he placed in 30th position, to lead driver Alex Tagliani. Conquest had made the call last year, so now Alex is able to repay the debt to a friend. Bruno Junqueira is no stranger to American open-wheel racing (a stand out at Ganassi Racing and Newman Haas in ChampCar) or the Indy 500. He has competed in five previous Indianapolis 500 events capturing the pole in his second effort at the Indy 500 in 2002. Junqueira has led 52 laps at the famed 2.5 mile oval and has finished 5th on two occasions, 2001 and 2004. 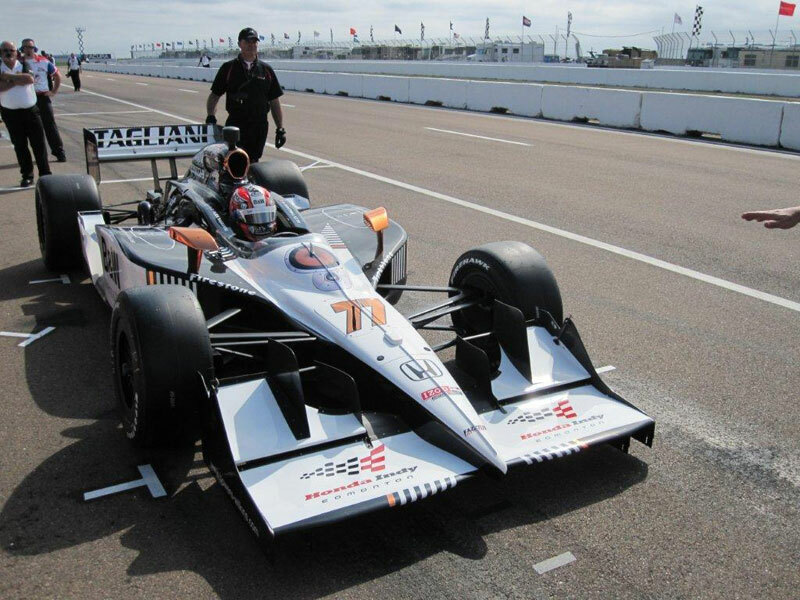 The FAZZT Race Team is a newly formed full-time entry for the 2010 IndyCar season owned by driver Alex Tagliani, motorsports veteran Jim Freudenberg, actor Jason Priestley and entrepreneur Andre Azzi. Owner Jim Freudenberg elaborated on the signing of Junqueira for the Indianapolis 500 saying, "When we formed the FAZZT Race Team we had a few goals in mind. One of those goals was that if we had the opportunity to field a second entry at Indianapolis that we wanted to put Bruno in that car. As for the balance of the season? ... who knows cuz' that's just racin'! 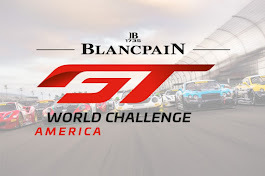 In a rare rain delayed Monday morning start, the second round of seventeen races, and the second of four street/road course races, will be run on the streets of St. Petersburg, Florida. The Honda Grand Prix of St. Petersburg is set to start at 10:00 am ET (broadcast on ESPN2) and on a gray morning with the sun coming out, the Dallara cars are expected to be fielded with wets but the track should dry out quickly. This post will be a compilation of selected "Tweets" from Twitter, Race Control announcements from IndyCar.com, Twitpics and direct dispatches as the race is run. RogerYasukawa Sun coming out and they won't be on the wets for long I think. Also some variance on downforce level. 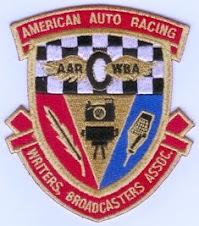 MyNameIsIRL The last race I missed watching because I had to work was won by Arie Luyendyk. I'm telling you in case I'm ever a category on "Jeopardy". RogerYasukawa Jon Secada singing the National Anthem. Pretty Cool!! Broadcast starts and there expects to be a 10 minute delay which will allow the teams to decide to run on wets or drys (tires) which could mix things up pretty well. kvracing Mario Moraes waiting for command to get in car. If we stay dry start, the race will run the scheduled distance of 100 laps and teams will be required to use the alternates [REDS] for 2 green laps. VisionRacing ARGH! #IZODIndyCar Race Control track feed is NOT making us online viewers happy! Any suggestions on a fix @IndyCarNation ? Row "HOT" announcements - all cars fired up! Cars out on warm-up. IndyCarPR #18 Duno spins in Turn 14 on the first pace lap. No contact. Dario Franchitti and Mike Conway have power spins on wet spots. DRRIndyCar Mike has spun in T2 but the car looks ok. Full course yellow. We're pitting when we can. Andretti up to second place on a strong pass. Dixon moves up past Power ... then passes Andretti for the lead on Lap 6 - Power has slipped to fourth. Marco26Web Dixon goes by to take the lead off Marco. Marco keeps close. indy44 Milka parked with handling issues. Barnhart can't handle it anymore. TheEDJE @indy44 - Milka thinks she is racing in CUP cars - Start and Park! DRRIndyCar There's a banner flapping around in Turn 10, warning the drivers to be careful in that area. A great start and a competitive race with actual passing for the second race in a row! IndyCarPR Lap 20: @scottdixon9 leads #12 Power by 5.9 seconds. Pits closed on first opportunity - Rahal, Tagliani, and a couple of others will not have to go in because they were in a couple of laps earlier. All top cars into the PITS! IndyCarPR #14 Meira stayed out and is the new race leader. 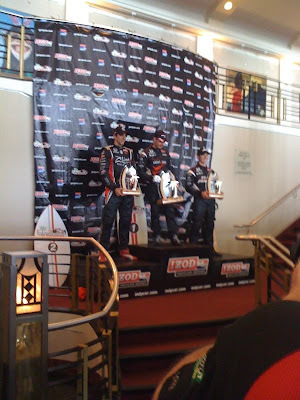 #10 Franchitti, #2 Matos and @ryanbriscoe6 stay on course. Sweeper truck jams up the field just after the cars come out from pitstops. Vitor has 34 laps on its fuel - suspect a 2 stop strategy --- Matos could be working the same strategy. IndyCarPR Lap 31: We're back to Green racing at St. Pete. IndyCarPR Lap 37: Leader #2 Matos pits for four red tires and fuel. Weldon had a broken rear shaft and was unable to avoid the accident. TheEDJE Lap 50 - Power, Wilson, Viso, Briscoe, De Silvestr, Castroneves, Patrick, Conway, Franchitti, and Meira are the Top 10 - top three - no pit. DRRIndyCar We're P2 with @JustinWilson22. Halfway to the checkered. 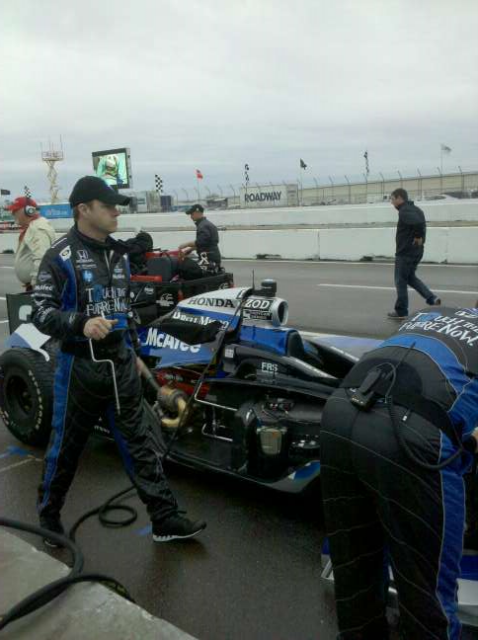 VisionRacing Lap 60 #IZODIndyCar St.Pete update: Top 5 Power Wilson Viso Dixon De Silvestro. Interesting race! curtcavin Dixon should win. He can make it on one more stop. Power cannot. kvracing Just after Viso pitted, yellow flag came out, and everyone in front of Viso still needs to pit!! curtcavin How was there not a big crash on that restart lap? EJ Viso takes over the lead as Meira steps out for a pitstop. VisionRacing Dixon in the wall?! BeccyGordon caution. Rahal spun Simon. Ryan looked like he got into the back of Graham but he thinks the wing might be okay. IndyCarNation Now we're full course yellow for @scottdixon9 who is in the Wall in Turn 9. DRRIndyCar 20 laps left. 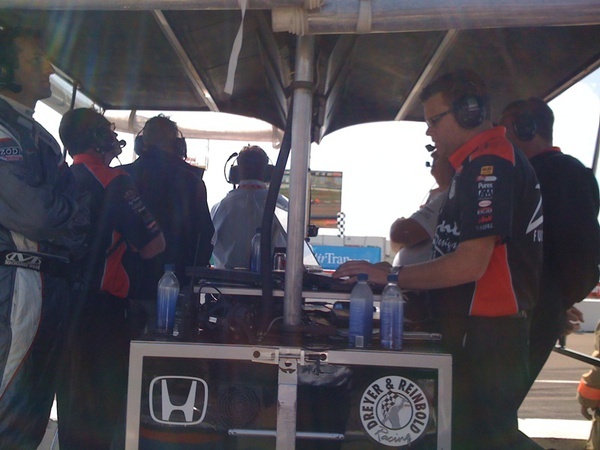 @JustinWilson22 still P2, running behind Will Power. Lot of racing left! IndyCarPR Lap 80: #12 Power leads @justinwilson22 by 1.0830 seconds. BeccyGordon Ryan got the short end of the stick when the caution came out & knocked the fuel game out of the picture. He was P3 of that group. IndyCarPR 13 to go... #12 Power leads @justinwilson22 by 1.0144 of a second. kvracing 10 laps remain, Viso running 17th. Moraes and Sato are out. indy44 Another great race. Looking good for #IZODIndyCar this season. Heading back to work, have a great day friends! 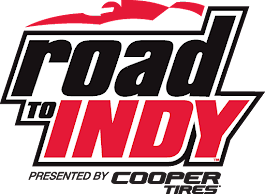 Final Order at 100 laps - Will Power/Penske, Justin Wilson/DRR, Ryan Briscoe/Penske, Helio Castroneves/Penske, Dario Franchitti/Target Chip Ganassi, Danica Patrick/Andretti, Raphael Matos/Luzco Dragon, Rahal/Dollar General Fischer Racing, and Tony Kanaan/Andretti for the Top 10! In the annals of automobile culture, nothing expresses the challenge of change more than a change in the culture of ownership of a manufacturing operation. So when Chinese low-end mass production automobile brand, Geely purchased the Swedish premium brand Vlovo from Ford for $1.8 billion, many thought this made sense. Geely could get help migrating up the quality and auto size chain from small and cheap, to mid-sized with a premium brand added on to coordinate. Ford sold Volvo at a time when their domestic stable brands are benefitting from American free-market loyalty ever since the Obama Administrationtook over and restructured the other two domestic brands ... retaining control over General Motors and selling off Chrysler to Italian automaker Fiat while hurting investors through a devaluation of position along the way. The culture difference between Volvo and Ford was never able to turn a profit so one has to question if the culture divide between China and Sweeden might be a bit more tough to cross even though China can boast the largest potential market on Earth. Chinese Government support and the desire for Geely management to win where others may fail could be the key. 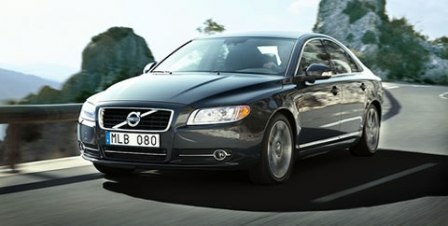 Understand now that when one purchases a Volvo ... they will be supporting a subset of the Chinese government as they seek to become the most powerful nation on the planet. Has Geely and China over-reached in this cross-borders international expansion with the purchase of an internationally recognized European luxury car operation (the first of its kind by a large Chinese equipment manufacturer)? Arthur D Little, the consultancy, has predicted that Geely would be one of only five Chinese automakers - out of more than 100 - likely to make it into the "exclusive club of global OEM champions" by 2020. Culture integration may be the first order of business to success or failure. The 36th annual Toyota Grand Prix of Long Beach activities get started in earnest this week as the ticket office opens and events are firmed up for all to enjoy during race weekend "At The Beach". The Grand Prix downtown ticket office opened Monday March 22, 2010, and is located at 300 E. Seaside Way in Long Beach (near the Long Beach Convention and Entertainment Center box office). The office is expected to be open from 9 a.m.-5 p.m. Monday through Friday, 9 a.m.-4 p.m. Saturday and Sunday. One of the anticipated events that kick-off the weekend of April 16-18 Toyota Grand Prix of Long Beach, featuring six races including the IZOD IndyCar Series, is the Long Beach Motorsports Walk of Fame induction ceremony that happens the day before the formal activities get started - April 15, 2010 at 11:00am - Pine Avenue in front of the Long Beach Convention Center. The City of Long Beach kicks off the 2010 Toyota Grand Prix of Long Beach by honoring two additional members to the 5th annual Motorsports Walk of Fame: Michael Andretti (whose father, Mario, is already honored with a medallion and whose son, Marco will be competing in the IZOD IndyCar Series race) and Danny Sullivan. The event honors motorsports stars that have either lived in Long Beach or have graced the oceanside city with their talent, along the way to a pinnacle career behind the wheel in sporting competition. The official three-day event, headlined with the fourth stop in the IZOD IndyCar Series 17 race season, that runs from April 16-18 also includes: the popular Toyota Pro/Celebrity Race; the technologically advanced sports cars of the Tequila Patron American Le Mans Series at Long Beach race; Firestone Indy Lights; Team Drifting Challenge and the SCCA Pro World Challenge. The Toyota Pro/Celebrity Race will again boast a star-studded lineup that includes the return of Keanu Reeves, who will defend his 2009 race win, skateboarding icon Tony Hawk and Christian Slater tangling with professional drivers such as former CART champion Jimmy Vasser and Drifting ace Tanner Foust in an always-action-packed 10-lap dash for charity. In addition to wheel-to-wheel racing, fans can enjoy the Tecate Light Fiesta Friday Concert Presented by Exitos 93.9 at 6:30 p.m., with the potent one-two punch of "Molotov" and "Maldita Vecindad." On Saturday, the Tecate Light Rock-N-Roar Concert Presented by KLOS at 6:30 p.m. features classic rockers "Cheap Trick." Both concerts, held on the Convention Center outdoor stage, are free to race ticket holders. The weekend-long Lifestyle Expo in the Convention Center - free to all ticket holders - features the alternative energy vehicles of "Green Power Prix-View" and highlights renewable energy sources and a host of energy tips for inside AND outside the home, as well as racecars, games, simulators, and BMX bike exhibitions. A new addition, Arena Jamm, will take place inside the Long Beach Arena and feature over 20 local musical acts providing a constant stream of entertainment throughout the weekend. 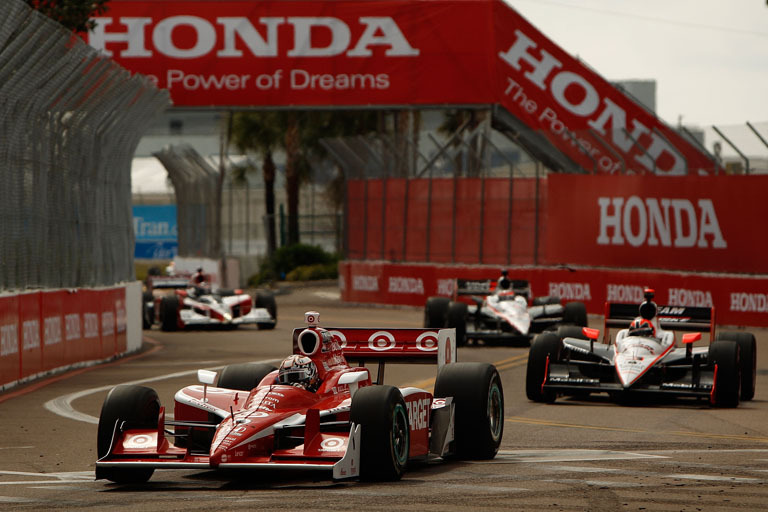 The famed race circuit, which includes the downtown streets of Long Beach surrounding the Long Beach Entertainment and Convention Center, is 1.97 miles in length and includes 11 turns. Grandstands lining the circuit include reserved seating, limited general admission seats, and seating for various hospitality club ticket packages. In addition to the downtown walk-up service, tickets can be ordered via credit card by using the toll-free ticket hotline, (888) 82-SPEED. Tickets can also be purchased on-line at www.gplb.com or at Ticketmaster outlets. Handicapped seating, IZOD IndyCar Paddock Passes, Super Photo tickets and a wide variety of hospitality club packages - including the all-new Vista Club atop the Hyatt Regency Hotel - are also available. So get your tickets to the 36th annual Race at the Beach weekend, see some famous race drivers get honored, and don't forget to slap on your "SPF 500" sunscreen. It always is sunny and hot around Shoreline Drive, the Aquarium and Ocean Avenue as the sound of high-revving naturally aspirated Honda engines echo off of the buildings and fill the air. Flowers, sunshine, SPF sunscreen, and the sound of race engines ... it MUST be spring in Southern California. With all of the winning Jimmie Johnson has been doing over these last four years, with consecutive national championships and now three wins in five races to begin a fifth year with few challenges from the forty car plus field ... in his 17 career races at the famed short-track at Bristol, Tennessee, Johnson has nine top-10 finishes but yesterday marked his first victory at Bristol Motor Speedway. Further, with this victory, Jimmie Johnson became one of just 12 drivers to score 50 or more career victories and now there are only five active tracks Johnson has not won on: Michigan, Infineon, Watkins Glen, Chicagoland and Homestead. With all of this winning the #48 car has had over these last four PLUS years, it is hard to find anything wrong except for this one troubling fact, after 55 sellout NASCAR Cup events at the Bristol track, the attendance was down at the Food City 500. The Bristol Motor Speedway can accommodate 160,000 and yesterday's attendance was NASCAR estimated to be 138,000. The speedway’s record streak of 55 sellouts began back in August 1982 – when the track could accommodate a mere 30,000 fans. 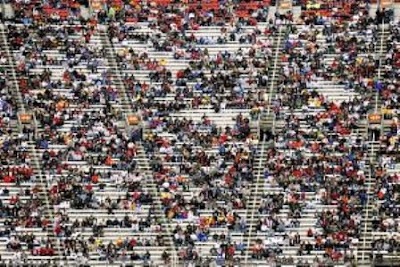 The contagion of empty seats at racing venues appears to have migrated from California to Bristol, Tennessee. NASCAR depends on fans. Sponsors suffer when fans don't attend races and television viewership drops. The average NASCAR fan must budget for attending a race. Going to an event might equate to a mortgage payment for the family home. Lowered attendance cause the dominoes to fall with local businesses suffering due to reduced influx of fans. During the Sprint Cup race at Bristol, Darrell Waltrip commented on air about the weather keeping fans away from the track. Weather was an unlikely suspect in the low attendance. Most people come to the track for the Nationwide race and the Sprint Cup race. It was bright and sunny for the Saturday race. The stands were probably only sixty percent filled for the Nationwide race at Bristol. There are those who say the COT [Car Of Tomorrow standardization] has dampened attendance. The wing will be gone in Martinsville making the Cup cars look more normalized. The "let the boys have at it" will continue to play out. Hopefully it will bring about the anticipated fan attention. Another camp of people believe Jimmie Johnson's winning ways have been a downer for the supporters of other drivers. He has won three out of the five races this season so far. It just may take the return of Dale Earnhardt Jr. to competitive, perhaps winning ways to offset the Johnson tedium and get the fans back in the stands. We can hope the economy and employment levels will rebound to improve the situation at hand. One still has to wonder if all the people who stay away from the races will be watching on television. For the sake of all concerned, hopefully the spread of empty seat syndrome won't become epidemic. As reported on VERSUS TV, Bob Jenkins stated that it has been measured that the highest ratings for any television broadcast ever in Brazil was registered for the opening race of the IZOD IndyCar Series in Sao Paulo, Brazil. This was a very good race on ANY level. The CCWS was fairly well represented on the driverside (Will Power, Ryan Hunter-Reay, Raphael Matos) ... not so much on the teamside (top CCWS transition team finish was KV Racing technology at P12). RHR and Vitor both were coming into the race having sustained back injuries last year - a very good drive? 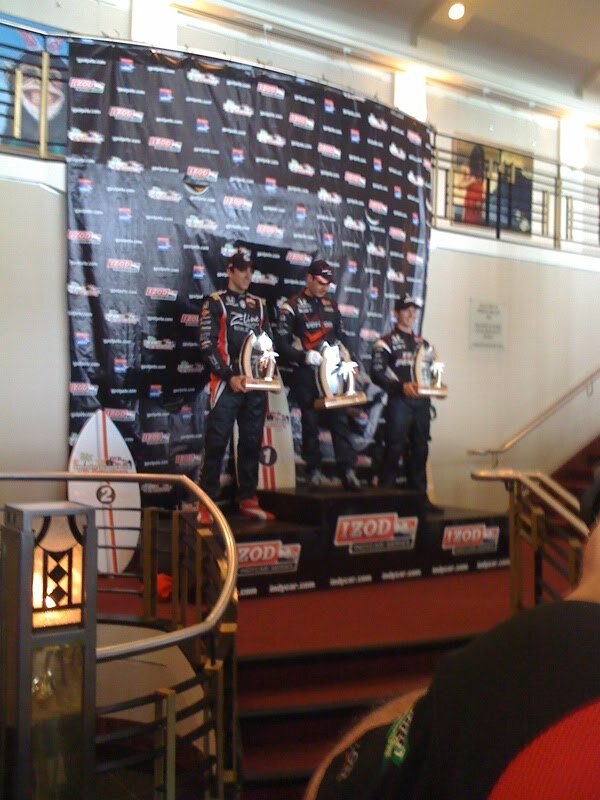 for those in the top five places - a good start for the first year series sponsor, IZOD! The race started with a first lap compression accident touched off by ICS rookie and seven year former Formula 1 driver for KV Racing Technology's Takuma Sato. Sato, came in too hot on the first corner setting up a chain reaction accident that aids in taking out KV Racing Technology teammate Mario Moraes (also has trouble slowing down) who lands on top of Andretti Autosport's Marco Andretti. The ratings were boosted by the fact that seven drivers from Brazil were competing in this first race of the 2010 ICS season and many are household names ... they are Vitor Meira - AJ Foyt Racing - finishing P3, Raphael Matos - Luczo Dragon Racing - finishing P4, Helio Castroneves - Verizon Penske Racing - finishing P9, Tony Kanaan - Andretti Autosports - finishing P10, Ana Beatriz (Bia Figueiredo) - Dreyer&Reinbold Racing - finishing P13, Mario Romancini - Conquest Racing - finishing P17, and Mario Moraes - KV Racing Technology - finishing P24. 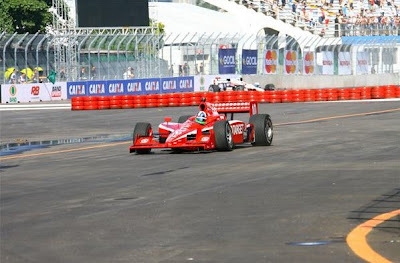 Defending IndyCar Series (ICS) champion, Dario Franchitti of Scotland, won the pole position (P1) for the IndyCar season-opener on the streets of Sao Paulo on Sunday. In Scottish country dancing, the reel is one of the four traditional step dances and is danced in reel time. 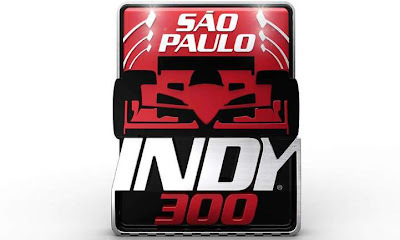 Qualifying for the inaugural Sao Paulo Indy 300 was moved to Sunday after drivers complained on Saturday that the track's front stretch lacked enough grip to keep the cars from stepping out making it unsafe. The straightaway of the track goes through a stadium-like Sambadrome and the surface is usually painted for the traditional Carnival dancing parades and it had remained slippery even though organizers removed the paint. The straight stretches for about a third of a mile and is the only part of the track constructed of concrete instead of asphalt and it is where today's 75-lap race is scheduled to start and finish. Grooves were added to the Sambadrome straightaway overnight to fix the problem. Meanwhile, optimum Brazilian was Tony Kanaan, that leaves in the sixth position. The trainings of classification of the stage of São Paulo must have happened in the afternoon of Saturday, but problems in the straight line of the Sambódromo had postponed the dispute for the morning of this sunday. After the emergenciais repairs in this stretch of the circuit of the Anhembi, the cars had obtained to develop the speed waited in the session that defined grid of jettison, although the constant dust in the track. For the Brazilian pilots, the trainings of classification were not very good. Tony Kanaan (Andretti) was the only one to dispute the last part of the session, when position was defined pole, but obtained only the sixth place. Excessively they had been being for the way: Helium Castroneves (Penske), Vitor Meira (AJ Foyt) and Raphael Matos (Luczo Dragon) had fallen in the second part, while Bia Figueiredo (Dreyer&Reinbold), Mario Romancini (Conquest) and Mario Moraes (KV) had left soon in the first one. Organizers had three months to set up the track following the announcement that the IndyCar Series would be coming to Brazil for the first time since the CART series raced in the Latin American country from 1996 to 2000. With the running of this race today, Sao Paulo becomes the only city in the world to host both an IndyCar Series and a Formula 1 (GP Brazil de Fórmula 1 to be held November 7th) in 2010. This post is a compilation of personal reactions file Shootout held on Saturday, March 6, 2010 at the famed Mojave Air and Space Port, a private airfield (featuring a 12,000 foot runway) in Mojave, CA. Mile Shootout format racing is already a popular speed event held in Texas, the Midwest, and the East Coast. Basically, a Mile Shootout allows participants to take an approved vehicle (motorcycle or car) from a standing-start, flat out speed, as fast as you can go in ONE MILE! Unlike a drag race, there is only one car on the track at a time. The measurement is not based on an elapsed time, only top speed. Because there is no E.T., burnouts and hot starts are not necessary or needed - just traction and a steady drive. Anybody 18 years or older, with a current valid driver’s license and insurance and a safe machine with good tires is eligible. Please note, however, that you must have permission of the vehicle’s owner to actually race it with one caveat ... NO RENTAL CARS are allowed. and finally a 143.9 having trouble finding 5th (took me a couple seconds). The DA was 3000 feet at an actual 2700 feet (cloudy cool damp with a sprinkle a couple times). My initial goal was to do between 130-140 and shoot for 140, thus upgrading me from the 150 class to the 165 class. I exceeded my goal. Big Red Camaro's best was 196.6 and finally a 200.7mph when I took off for home. 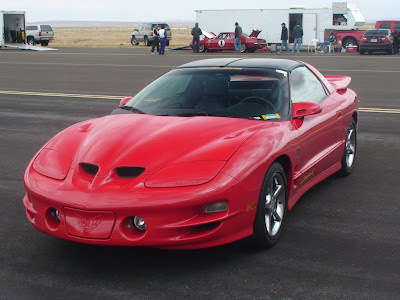 The ZR1 corvette was running a 165.6. 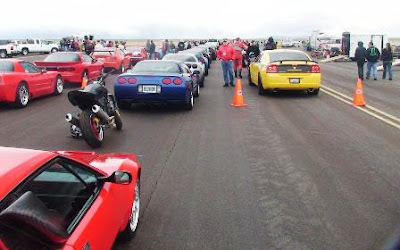 Many corvette ran 150's and a couple ran 170's. 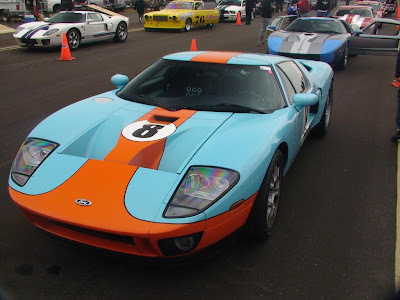 Many of the Ford GT's ran 160's and a couple ran in the mid 180's. A stock Dodge magnum SRT8 ran a 152.8. Need 400+ hp to break the 150's. Besides Big Red, I was THE ONLY f-body there. Seemed like a Corvette vs Ford GT top speed shootout ... GT's won with a 186 mph to speed pass. The fastest of my 3 runs was 182.3 mph. i have a 2.87" pulley and 100 octane heffner tune with an MMP X-pipe. i was on stock tires. My weather station was reporting a corrected DA of 4000' above sea level and a 10 mph crosswind on my run. It was nice meeting everybody and i had a great time. I think with the whipple and some nitrous i can go 200+ mph at the mojave mile. I have done 4 different 1 mile top speed shootouts in America now. 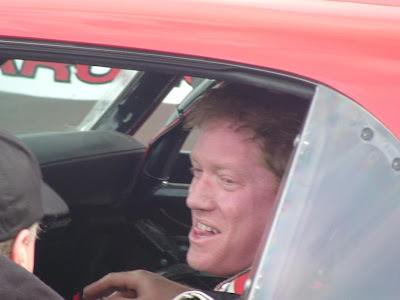 I have done the "HIGH noon" shootout twice at the Silver State Classic, the Texas Mile once, the "HIGH Roller" mile shootout once and the Mojave Mile once. By far the best location, track and event is the "Mojave Mile"
What a fun and addictive game.....especially for a 1st timer. I have a pulley/tune and x-pipe mod on Bridgestone. 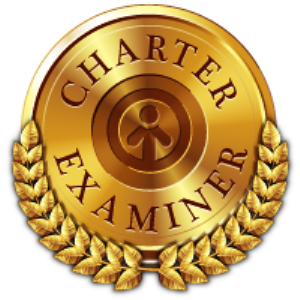 As a 1st timer, i had to do a qualify run to demonstrate the ability to reach 140-150 without "incedents". I reached 169.7; 172.1;and 177.8. I was thorough happy as my goal for the day was to reach 170. Then, FastFreddy and Skyrex told me the "secret sauce" to get to 180! They told me to stay in 4th, since shifting to 5th would lose too much rpm and a few mph on the acceleration. So armed with this tip, I was all pumped for the next run. Unfortunately, in 3rd, I held it a little too long and when it touched the rev limiter I lost a second or 2, I ended with 176.8! Backward, lost 1mph not acceptable! One more run... In the final run of the day, I was the 15th car in the 20 cars run group sitting at the staging spot. Still pumped and all I could think of was 180, 180..... the wait in the cue drove me nuts.... Finally, I was waved to the starting box. The green flag dropped, I went for it!! Come on, baby!! I wanted that 180 badly!!! Too eager, I spun the wheels again in 1st at 3k rpm.... stayed in 4th gear and vrrrroooooommmmm..... 178.8! Oh well, didn't get 180, sorry Skyrex and FastFreddy.... Man, only if I could do one or two more runs to get better the take off in 1st gear, I know I'd get there. Still, thoroughly satisfied!! Also worth mentioning, I was too glad to meet all the nice GT folks, The Apollo's (Terry and Veronica- you go girl! 177, wow! 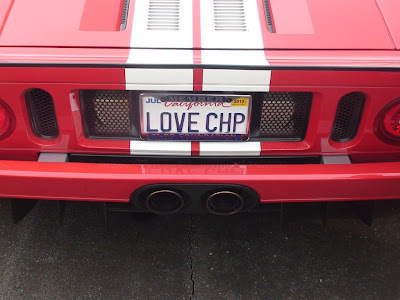 ); Love CHP- Richard and Sue; FastFreddy, and Skyrex and a few others whose name escaped me at the moment. Clinton had a great showing, thundering down the track; his acceleration is visually evidenced!! He had the fastest non-race car speed at 188 and change. 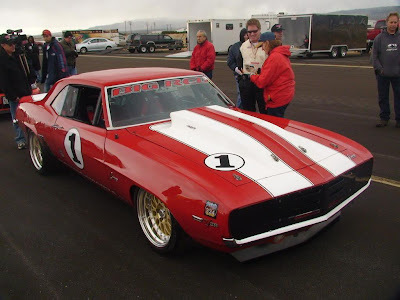 I don't count the 200.7 reached be the Camero as it is a race car. The Mojave Mile Shootout was open to anyone with a car or motorcycle, and, as this event grows in popularity, it is hoped that it will be held multiple times per year. What is the Mojave Mile Shootout? One fast and crazy run. Come one and come all who feel they have a really fast vehicle that would be able to go from a standing start and finish a one mile run on an internationally famous and private concrete airstrip with the fastest time and speed. A competition format that has been run on the East Coast and Midwest comes to the crucible of automobile culture here in Southern California this weekend. The event will be conducted on the 12,000-foot runway at Mojave Air and Space Port near where the 14 and 58 highways meet. 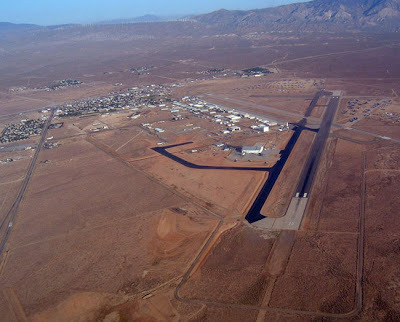 The Mojave Air and Space Port has become a beacon of aero-technical development where Burt Ruttan built the Voyager (the aircraft that made Ruttan's 1986 around-the-world trip) and the location of Scaled Composites, the Virgin Atlantic sponsored company building a spaceship for commercial purposes. 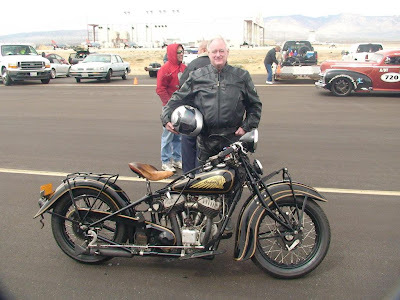 The first ever Mojave Mile Shootout event is scheduled to start at 8:00am on March 6, 2010 and will feature two-wheeled motorcycles and 4-wheeled vehicles eligible to compete in the various classes, provided they meet stringent safety regulations. As a result of the rules, no rental cars will be allowed to compete. Only one vehicle will be run at any one time, with laser beams triggering the electronic timing. The "speed trap" used to measure speed will consist of the last 132 feet of the one-mile track. Each car will use a semi-standing start (20-foot prestart box) and no elapsed time will be kept.